I was a marketing copywriter; my husband was a touring sound engineer ... [w]e bought 10 acres of land in Waller County, quit our jobs and began to farm - something we knew not ONE thing about before we started. Now we are goat farmers. 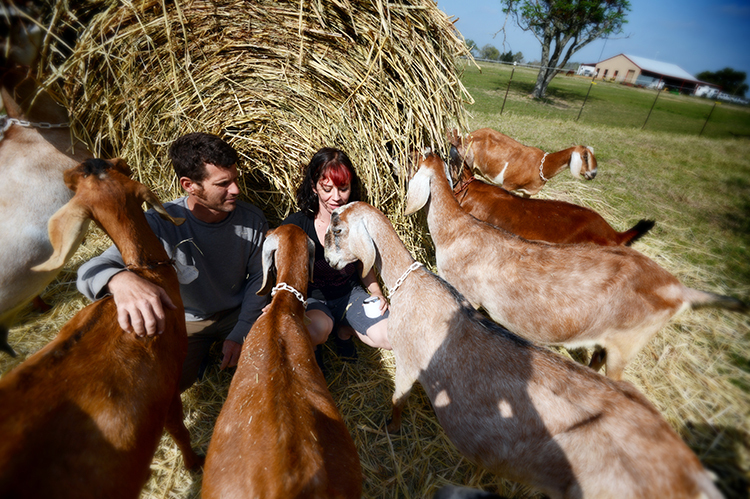 We farm using sustainable and humane practices and we make cheese that we sell to people and restaurants in Houston. So let me get this straight: a story about goat farmers falls in my lap, and they're located a mere 45 minutes out of town? There was no way I could pass that up. We traded emails, and last week, I headed out to Blue Heron Farm. 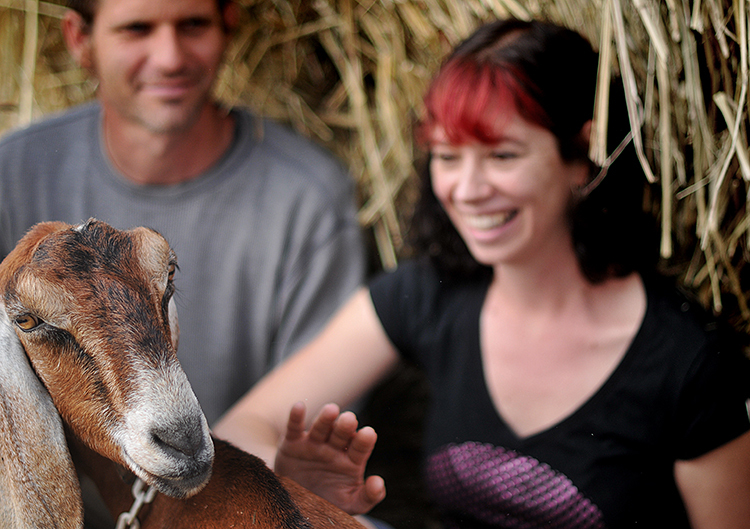 Lisa and Christian Seger are the founders of Blue Heron Farm, and have been running it for 7 years now. 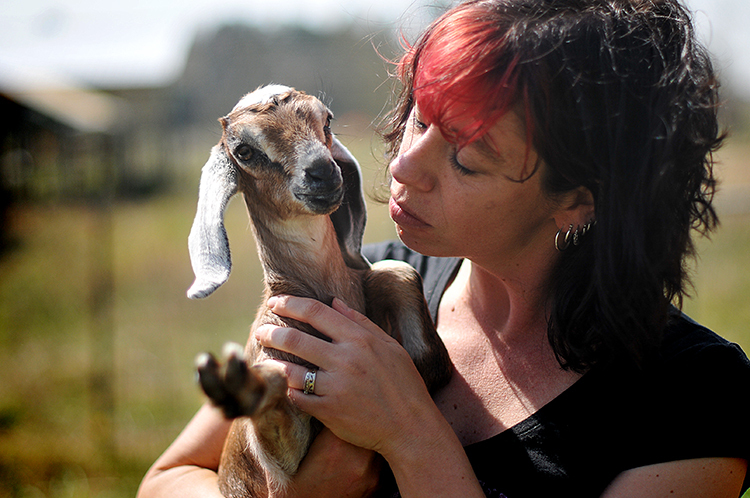 They raise Nubian goats, a breed that apparently make some of the best goat cheese there is. I could tell from our emails and what I'd read on their website that they were smart and incredibly funny (they used to have 2 pigs named The Notorious P.I.G. and Tu-Pork Shakur, for heaven's sake), so I knew I'd like them immediately. What I didn't know about was how I'd feel about the goats. I had no idea what to expect. While I grew up in a small village in Trinidad, we certainly didn't have any livestock, so I didn't know anything about goats. I assumed they were smelly. I'd heard that they eat everything, including your clothing. And I knew that they yell like humans. I did not expect them to be big, overgrown puppies. These goats were amazing. They're huge -- much bigger than the goats I ever saw in Trinidad -- and were so goofy-looking, with their big, floppy ears. They were also completely friendly and even affectionate: if you stopped petting them for a moment, they would rub their giant heads against your hip, begging for more attention. When I arrived, they were all out in this great big field, where they could roam wherever they pleased. (Well, most of them, anyway. A few were heavily pregnant, and they weren't much in the mood to roam.) So much fun. After I caught that one above being kissed by Lisa, she apparently got shy. No worries -- even if that kid wanted her privacy, there was one doe named Aunt Fanny who had no problem posing for me. 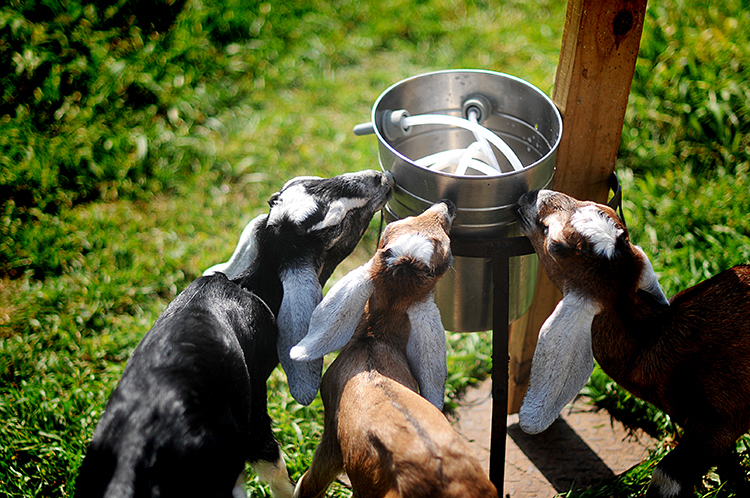 And speaking of cheese: after marveling at these happy goats, Lisa took me on a tour of the dairy. She showed me the milking station, and gave me a tour of their pristine cheesemaking kitchen. That vat is chock-full of cheese. Needless to say, I demanded ... er, I mean, I politely asked for ... a taste. Oh sweet mother of Gumby. Now, I love cheese, but I have to admit that other than feta, goat cheese (or chèvre) is not one of my favourites. But this ... this was something else. It was so incredibly creamy, tasting more like cheese-flavoured-butter than cheese. My eyes widened. Lisa smiled, "Good, right? We've converted many a goat-cheese-hater." "I don't understand! Why does it taste so different?" "Well," Lisa explained, "probably a couple of reasons. The first is that most goat cheese is a blend of different types of goat milk, but ours is made solely from Nubian goats, so that could be part of it. But honestly? I think the goats are happy, and peaceful. They're loved and cared for. They pretty much have the run of the farm. They're not stressed, like they might be in a bigger, more commercial operation. And I think you can taste the difference in the cheese." Lisa let me also taste their feta, which was equally sublime. It's no wonder that some of the best restaurants in Houston buy their products: they literally were the best cheeses I've ever eaten. Lisa led me around the farm for 3 hours that day, and I took tons of photographs -- most of which I'll be saving for the book. But in addition to be incredibly grateful for the tour and their interview, I'm so thrilled that I've finally discovered Blue Heron Farm -- and my family will definitely be visiting the farmer's market on Saturdays to purchase more of their products. So thanks, Lisa and Christian, for your wonderful generosity and the tour of your happy farm. You guys are really awesome. And so are your goats. Song: Sheep go to heaven by Cake. Today's song brought to you by Lisa. Told you she was funny. I found this out after the fact, but under the heading "it's a small world after all": it turns out that Christian is a childhood pal of my dear friend, Katherine Center. And as it happens, Blue Heron Farm is the inspiration behind her latest book, The Lost Husband, to be released on May 7th, but now available for pre-order. Katherine's publisher, also coincidentally, kindly sent me an advanced copy of the book, and I've been turning its pages ever since. I've read enough to conclude that it might just be the perfect, lighthearted summer read, so if this sounds like your cup of tea, be sure to grab yourself a copy. 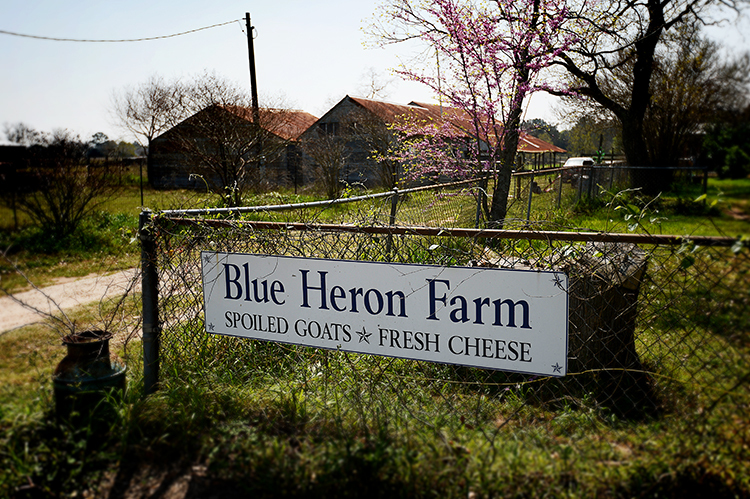 And if you're in Houston (or anywhere near Waller County), I strongly recommend that you get yourself some of Blue Heron's cheese to munch on while you do. It's the perfect combination.